What an impressive, eclectic, and thought provoking show! I have never seen or heard anyone play Bach so well on the viola- a beautiful burnished tone and an improvisatory sense imparted to the music- all the while getting into complex yoga poses with a partner. That alone is worth the admission price. The show also featured percussionist Luis Perez who cunningly conjured up the atmosphere of night time in a Brazilian rainforest with his battery of original instruments. Overall, a thoroughly enjoyable show! Karen Elaine is one of those special healers that authors write stories about. Her ability to sense your physical, emotional, and energetic imbalances and correct them with her pure connection to Reiki energy is nothing less than awe inspiring. If you have the opportunity to experience it yourself, you'll know what I mean. Please understand this: Karen is more than a viola or violin teacher. She uses teaching to support people being the best they can be. Working with her I find the things that held me back from growing as a viola player are - amazingly - things that blocked breakthroughs in living more the way I've wanted to as well. Karen is a master of her instrument - a magnificent player of profound musicality. Because she's done the tens of thousands of hours of work herself she knows how to address the technical hurdles a student must face. But more than that, she clearly applies the same dedication to her inner life. That means she's been able to not only support my growth as a string player but has, through her perceptive teaching, enhanced my enjoyment of life by showing how to recognize and break through hyper self-criticism and tentativeness. Karen Elaine is a gem - a diamond that polishes others and a precious addition to this world. Am so grateful to know her! My niece and I decided to try one of your poses on your website. We have a ways to go but not too shabby for a first try. Karen provides both the novice and experienced yoga practitioner a comfortable and encouraging introduction to the challenging, rewarding, and artful joys of acro yoga. I have had the pleasure to start as one of those novices, and have been challenged to grow under her tutelage. As part of her desire to create an inviting and safe space, Karen begins each session with a sincere and professional inquiry about any chronic or new physical ailments or beginner trepidations that an individual might have, and adapts their participation in the session accordingly. She warms us up with vinyasa flows and partner stretches to prepare us for the challenges and fun ahead. She beautifully and gracefully demonstrates each new technique, pose and transition before we attempt them ourselves. And while spotting and helping us create shapes and practice movements, Karen verbally monitors our level of comfort and can detect non-verbal cues of breathing, posture and misalignment to help guide and refine our efforts. Karen pairs and matches participants in combinations to provide everyone with a chance to explore lifting, basing and flying. 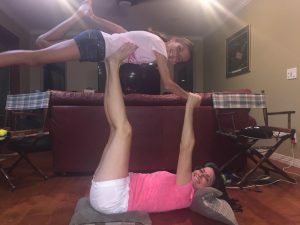 While no lightweight myself, Karen not only lifts and balances me through flying poses but others even heavier with ease. She's worked on my individual needs of alignment and flexibility, and has gained my trust when introducing me to new challenges. On the downside (if you're a stickler for schedules), we often have so much fun that Karen's sessions sometimes extend beyond the allotted time. Yet she always manages to send us home after a restful savasana. I encourage you to visit a workshop to experience the pleasure of learning and improving your acro yoga with Karen!